I’d like to start this review by stating quite clearly that we are NOT campers. Nope, not even a little bit. In fact, it has taken me 40 years to go camping! Anytime my husband suggested it, I would quickly counteract with a wonderful hotel I’d found that would be oh so perfect to go to instead – and bless him he never pushed it. Turns out, on further reflection, that he genuinely believed that I would manage half a night camping before throwing in the towel and dragging us all to the closest hotel I could. So, when I told him that I had booked to go to Camp Bestival AND that we were going to actually camp, the colour drained out of his face incredibly fast. He came up with numerous excuses as to why we couldn’t camp, with number one being that we didn’t have a tent! Hmm, good point Mr Newby! 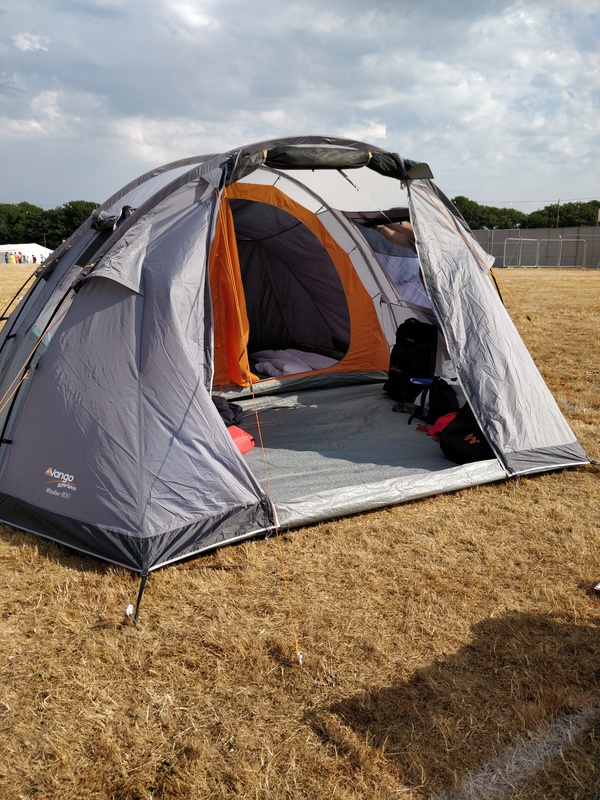 But I wasn’t going to let that deter us, so when we were offered the chance to review the Vango Experience Winslow 600 I jumped at the chance, and the die was cast! Sounded perfect! 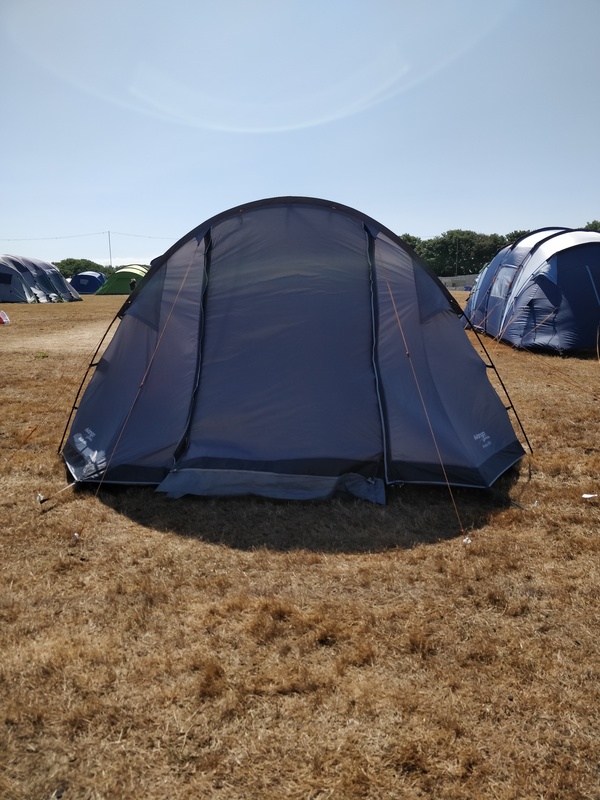 We needed a tent that we could put up really quickly, would fit 4 of us comfortably and would work well for a three night stay. Well…here’s how we got on! You could pretty much guarantee that if we were going to fall out, it was going to be when putting the tent up. I fully expected hours of confusion, cursing and instructions that made no sense (those Paul would be giving to me!!). So, when he sent me off with the children to go and get the rest of the stuff whilst he put it up on his own, I was a bit surprised. I was even more surprised when I came back 20 minutes later to find a full erect tent, perfectly positioned and ready to go. In fact I don’t think the word ‘surprise’ gives how I felt justice! Paul said that it was a really easy tent to put up, all the poles went where they should and the tent pegs were really sturdy. Well, if novice campers like us can put it up, then anyone can! So, the first thing on the list sorted! My second concern was how we would live and sleep together for 3 nights with the 4 of us all bundled in together. So imagine my delight when I discovered that not only was there a separate sleeping pod with darkened canvas, but that there was a divider as well to create 2 rooms. We easily managed to fit a double mattress on one side and two single mattresses on the other side, giving us ample space. 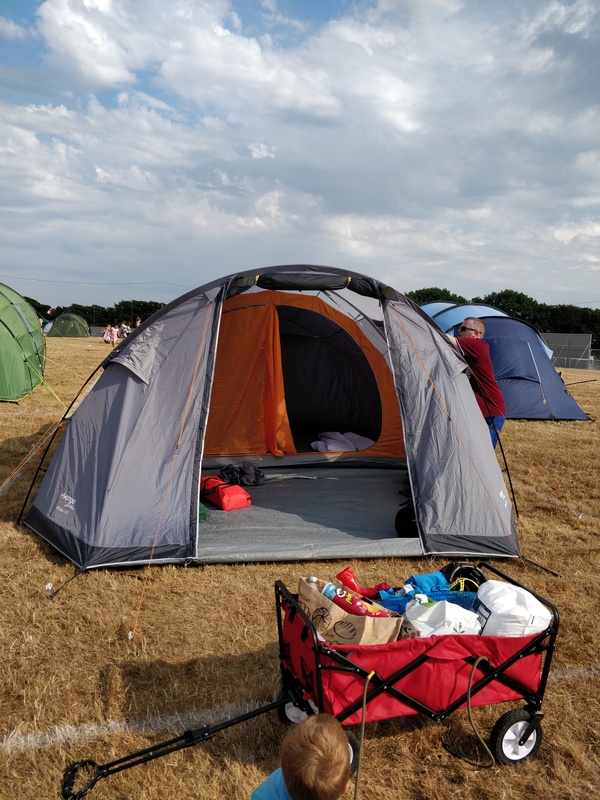 In a slightly mad moment, Paul decided to bring along his camping bed which turned out to be a great idea, as our double mattress was a little small for such hot weather, so he set the camping bed up in the entrance which was a huge area – and slept there. So really we had 3 rooms for sleeping in, which was perfect in the summer heat. In fact talking about the heat, that was another thing I was a bit worried about. With soaring temperatures, and nights hitting 19 degrees, I was really worried about us all being too hot. But the tent had these great side windows which you could ‘open’ to let the air in, but close when you left the tent. They brought in a very welcome breeze and we were really cosy inside at night. There was loads of room in the main entrance too for us to prepare breakfast (I say prepare, I mean ‘take out the packaged croissants and biscuits’ but still! ), get dressed and generally chill out before we went to the festival. All in all, it really was fab! We really did enjoy our nights camping out in the tent – and on the first night, I really understood the thrill of camping. Choosing the right tent is definitely one of the biggest areas, and our tent was just utterly perfect for novice campers. We did have a bit of excitement the second night when one of the biggest storms hit the area and we woke to find the tent blowing above us. But, it really stood up to the severe weather. Paul headed out at 3am to check the guy lines just as we realised he hadn’t pulled them tight enough, so that was a close call, but apart from that, the tent held up brilliantly – which was great to see as many others collapsed in the high winds! So all in all – will we camp again? Absolutely! We all loved our time, and the ease of putting the tent up, the space it afforded and the freedom it gave us was wonderful. I shall leave you with the last image of our tent which was one more concern Paul had – putting it away!! 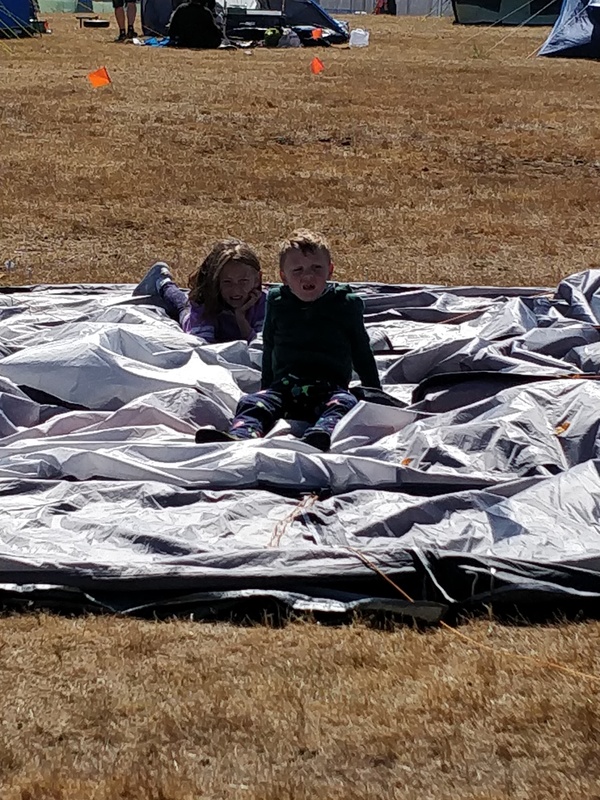 But, with the help of two small people, he had the tent down and packed back into the bag in under 30 minutes in some of the strongest winds I’ve ever encountered. Now if that doesn’t tell you how fab our tent was, well..nothing will! 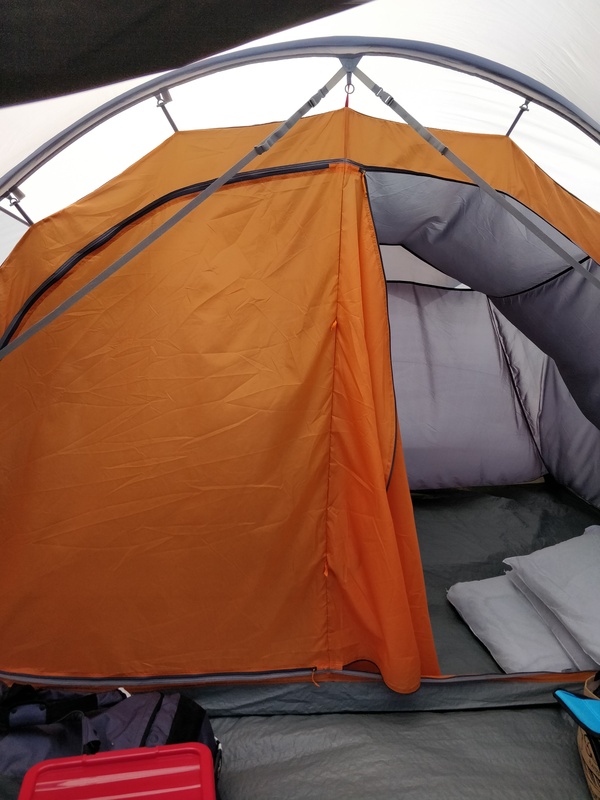 Disclosure : We were offered the Vango Experience Winslow 600 in return for an honest review. All opinions and photographs are are own. Wow, looks like a fantastic tent for first time campers! Hope you had an amazing time there. Thanks so much Jade! 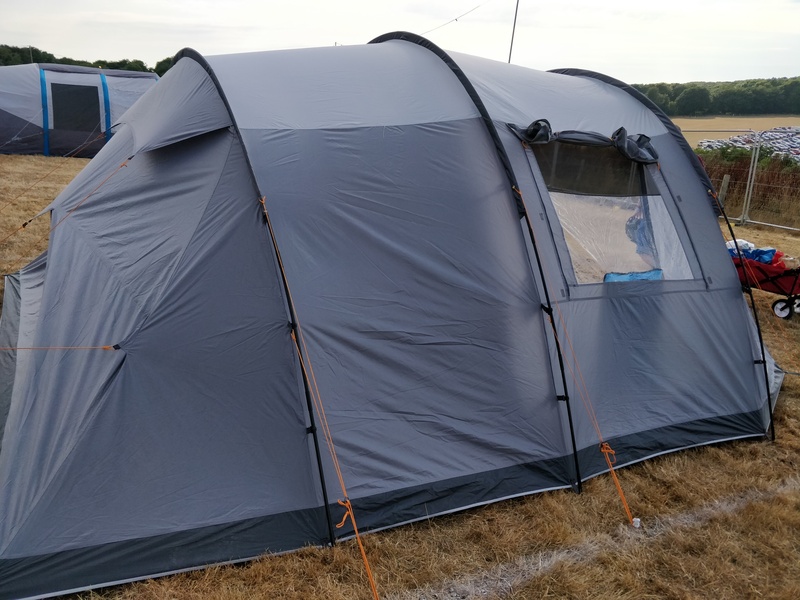 It really is a brilliant tent for novice campers – it was utterly perfect for us!